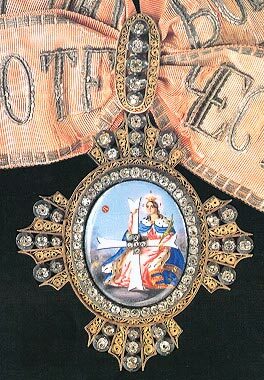 The Order of St. Catherine, the only Order of the Russian Empire for women (excluding the Order of Saint Olga, given only in 1916-1917), was founded in 1714 in order to commemorate and immortalize the actions of Empress Catherine I, wife of Peter the Great, whose selfless sale of her jewelry and property to pay the ransom of the Cossacks who were captured by the Turks in 1711 earned her the admiration of the court and country. The Insignia of the badge of the order features at its center an enameled image of Saint Catherine in a white gown with a red cloak. In her right hand, the Saint holds a large white cross (a symbol of her faith) and behind her a large wheel (the symbol of her martyrdom). 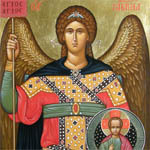 In her left hand, the Saint holds a palm frond. Over her head are her initials Sv. E (Svyataya Elizaveta) and between the arms of the cross, the letters D.S.F.R. (Domine Salvum Fac Regem, God Save the Tsar). On the obverse is an image of eagles destroying a nest of snakes at the foot of a ruined tower, at the top of which is a nest of eaglets. Above is the motto "Aequant Munia Comparis" (By her works she is to her husband compared). The Badges were 8.5 cm. high, and 7.5 cm. wide. Every Russian Grand Duchess was conferred the Grand Cross of the order at her christening (or upon her marriage into the Romanov family), and princesses of the Imperial Blood were invested upon attaining their majority at 18. In addition to the members of the Imperial Family, 106 women were allowed to be members of the order; 12 Dames Grand Cross, and 94 Dames Small Cross. Peter decreed that Catherine, and every subsequent Empress, would serve as Grand Mistress of the order for life. Women elected to the order were so honored because of their philanthropic and charitable work outside of their work at Court. In a departure from the established rules, on February 5, 1727, Prince A.A. Menshikov was granted the Order of Saint Catherine "in tribute to his modesty". He was the only man ever to be so honored, and a portrait of him survives wearing the Order of St. Catherine. The Statute of April 5th, 1798, confirmed the appearance of the Order, which had undergone changes during the reign of Catherine II. A doll from the “Wardrobe of the Office of Orders”, (now preserved in the collections of the Kremlin Armory Museum, inv. No TK-3113) shows the robes of the Deputy Mistress of the order in detail. This doll’s robes match exactly the robes of Empress Maria Feodorovna, wife of Paul I, from the period in which she served as Deputy. 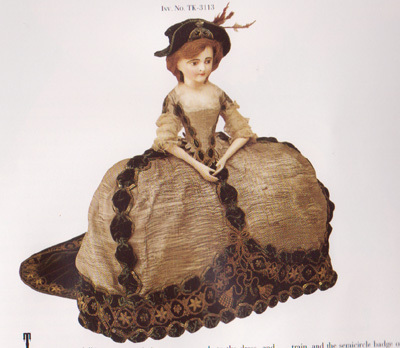 A doll from the “Wardrobe of the Office of Orders” showing the eighteenth century dress of the Deputy of the Order. A brocade dress with gold-embroidered green velvet train and cap with red and white feathers. A brocade panniered gown with rouching, trim, and train of green velvet embroidered heavily in gold was worn with a velvet cap, the upturned brim of which was decorated with a Catherine wheel and cross in gold braid. The grand mistress of the order had a wheel and cross in gold, set with diamonds and rubies. There exists today in the Diamond Fund of the Russian Federation, a unique diamond and ruby “Cap Badge” of the order in the form of the Catherine Wheel, surmounted by a diamond cross. The gown was the same for all members of the order, though the trains and embroidery were most elaborate for the Grand Mistress and the Deputy, then decreasingly so for the ladies of the first and second classes of the order. Cap Badge of the Grand Mistress of the Order of Saint Catherine in Gold, silver, diamonds and rubies. Worn by the Grand Mistress on the upturned brim of the green velvet cap of the order. 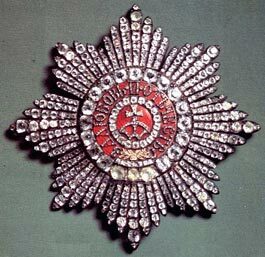 On the 20th of October, 1856, Alexander II made further modifications, and decreed that henceforth, the star and badges of the Order were to be diamond-set. The Grand Cross and badge were to be completely set with diamonds, while the badges for Dames Small Cross were to be a mixture of diamonds and gold filigree work. There were plans for a Slavic revival modification to the robes of the order, as well as the creation of a collar chain for the members of the Imperial family, but these plans were never executed. 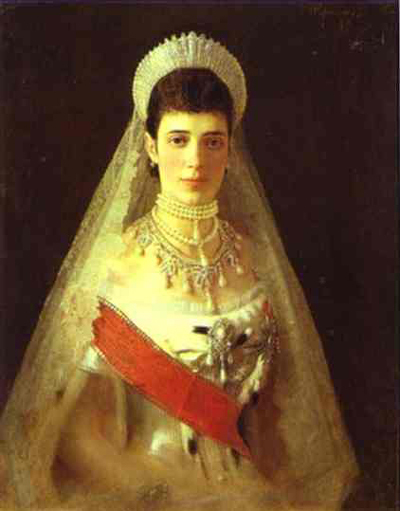 A portrait by Kramskoy from the 1880’s of the Last Grand Mistress of the Order, Empress Maria Feodorovna wearing her insignia. Dames of the first class wore the sash (10mm wide) over their right shoulder, with the badge attached to a bow embroidered with the motto of the order at their waist. The star was worn on the left side of the breast. 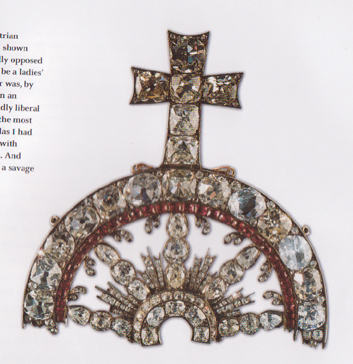 Women of the Small Cross wore the badge suspended from a bow (4.5 cm wide) on the left shoulder. Women were elected members of the Order by the Emperor, but their patents were signed by the Empress, who served as Grand Mistress. Since the Empress served as Grand Mistress for life, it can be assumed that Empress Maria Feodorovna was the last Grand Mistress of the Order before the Revolution. The honor of membership in the order cannot be underestimated. Membership offered Dames of the Order complete access to the Imperial family, and a lifetime connection to them. When Alexandra Feodorovna and her daughters went into exile in Siberia, they took their badges and stars with them. They were recovered in 1933. The eight pointed star, below, of the order was 9 cm wide, made of silver, and set with diamonds. In the center, a silver cross rests on a scarlet enamel field, surrounded by gold letters reading in Russian "For Love and For the Fatherland"
The Order of Saint Catherine's function was largely ceremonial. The Order contributed to churches of Saint Catherine, as well as hospitals and Orphanages which honored the Saint. The twelve Dames "Grand Cross" were female members of Foreign Ruling Houses. Queen Alexandra of Great Britain was made a Dame Grand Cross of the Order of Saint Catherine by Alexander II, Princess Alice of Greece (Prince Phillip's mother) was also a member of the Order. The 94 Dames Small Cross were women of the highest nobility, who were part of the Suite of the Empress that had made important philanthropic or charitable works. Only the death of a dame freed a place for a new member. As a result, with the exception of the members of the Imperial Family, the women of the Order were generally of advanced age. The Order was at its most popular (and had its highest turnover) in the mid nineteenth century. Nicholas I presented the Order to 176 women. In total, between 1714 and 1917, the Order was presented 734 times in both classes. The Order met for a Mass and a banquet every year on the Order's Holiday (24th November). 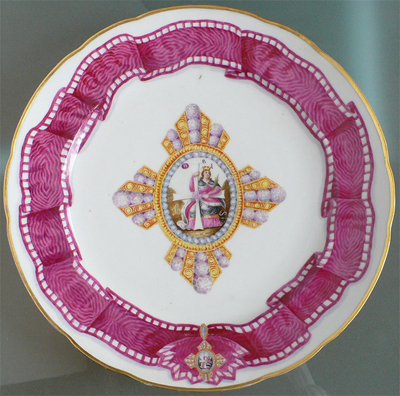 A plate by Popov from the late 1830’s from the Order of St. Catherine Service, used during the annual banquet on November 24th. Wearing the robes and insignia of the Order, the women of the Imperial Family, followed by the 106 Dames Grand and Small Cross would lead a procession from the Imperial Chapel to a banqueting hall specially prepared for the occasion. 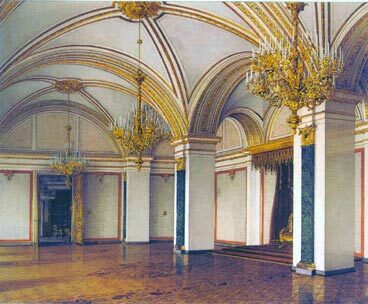 The Hall of Saint Catherine in the great Kremlin Palace was designed by Konstantin Andreievitch Ton, and impresses because of the elegance of its proportions, rather than by its size. The ornamentation of the room took its clues from the robes and insignia of the order. The white ceiling and silver moiré walls contribute to the feeling of lightness in the room, and the walls are bordered by the scarlet ribbon of the order, the crosses set with large paste stones. Above: a view of Saint Catherine's Hall today, where President Putin receives Foreign Diplomats and Delegations to the Russian Federation. 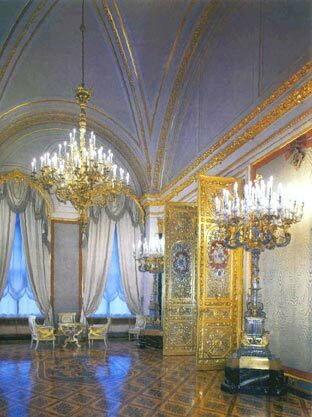 Note the extraordinary torcheres ordered by Alexander II. The elaborate doors of the hall are masterpieces of the metalworker's art, and feature the star and badge of the order entwined by branches of gilded laurel. Also of note in the hall are two large crystal torchères, which were ordered specifically for this room from the Russian Imperial Glass Factory; four smaller similar torchères were ordered to be created by Baccarat in Paris (these smaller four are now missing; interestingly, today the Kremlin guides mistakenly attribute the larger two to Baccarat, forgetting their Imperial Russian origin). The pilasters and columns in this room are veneered in Malachite. Even today, the beauty and function of the Hall of Saint Catherine remain intact, as all foreign delegations and diplomats are received in this room. Today, the Order of Saint Catherine is no longer granted by the Russian State. 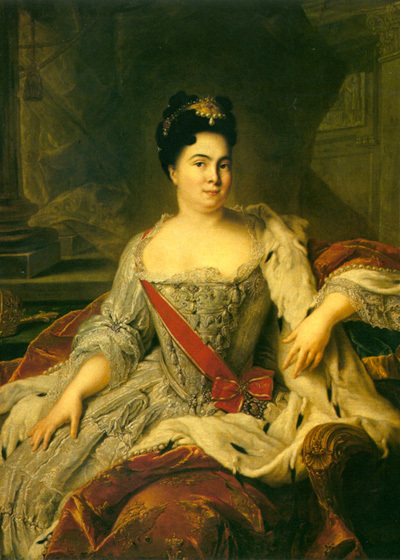 Maria Vladimirovna, pretender to the Russian Throne, claims the right to award the order, though her mother, the Grand Duchess Leonida, should rightly serve as Grand Mistress. 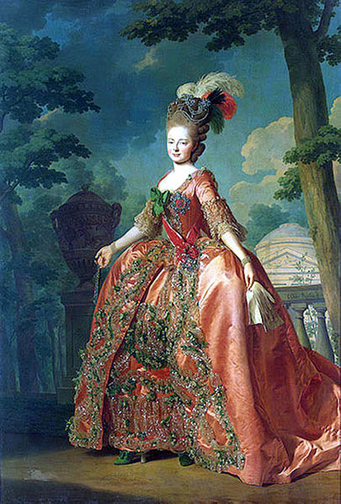 A portrait of Empress Catherine I, first Grand Mistress of the Order of Saint Catherine, wearing the insignia of the order, painted by Jean Marc Nattier.